Nutty-like, soft and solid, protein and mineral rich and also rich in dietary fiber. 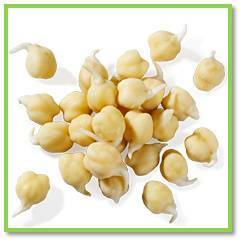 They originate from Asia and are reminiscent of the appearance of yellow peas. Chickpeas are very good in stews, soups, pies and salads. Or why not try to make a good hummus to serve your guests? This mix of chickpeas and tahini is very protein rich and a delicious dish for vegetarians who do not eat other high-protein foods. Use a food processor and add the required amount of cooked cooking liquid to form a smooth mass. Save some whole chickpeas to the garnish. Add crushed garlic, 1 1/4 dl tahini and juice from two lemons. Taste and adjust the taste with more tahini, lemon if needed, salt and pepper. Pour the tub over a shallow serving dish. Smooth to the surface using the back of a spoon and pour a little olive oil in the middle. Sprinkle some peppers and garnish with the whole cooked chickpeas. Ev. also cut lettuce parsley on top. Serve with pita bread. Boil: Put in the pan and cover with cold water. Boil and simmer under cover until soft, about 1 1/2 to 1/2 hour. Foam the surface occasionally and fill with water. Put in small peeled onions and a layer of leaf in the saucepan. When the chickpeas are soft, turn off the water (if you are going to make hummus, the water should be saved and used later) and use the peas to what you want.